Based on the theme of "distance," and informed by the experience of being swayed between the closeness engendered by the cultural maturity of Cuba and Japan and the distance resulting from differences in the two countries' social and political systems, this landmark exhibition posed questions about closeness and distance as well as about the nature of these relationships that cannot be grasped from only one side. 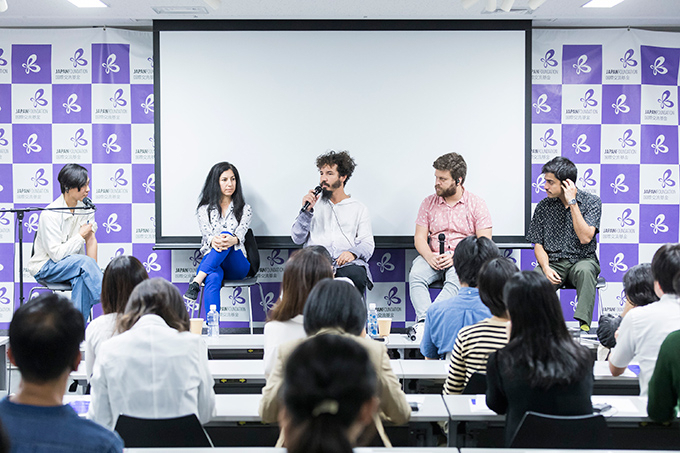 During the Tokyo exhibition, the four Cuban artists participated in a talk session at the Japan Foundation's Sakura Hall on June 8, 2018. At this event, the artists, who live and work in Cuba, gave presentations on their activities, followed by a lively discussion. 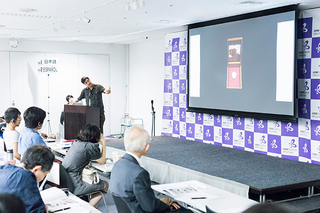 Hiroyuki Hattori, one of the exhibition's curators, served as the talk session moderator. 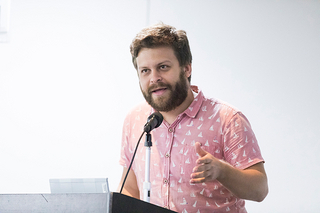 He began with a report looking back on the original exhibition at Wifredo Lam Contemporary Art Center in Havana, giving an overview of the entire exhibition along with the process of producing it, and explaining that the Cuban and Japanese curator team and the artists gradually came to appreciate the distance and the differences between them as they talked and exchanged emails with each other. "There were various things that we could not grasp about the unique history and culture of Cuba unless we asked the artists themselves to explain in their own words." He also added that the ties have just begun: "What is important is what we go on to develop from the experiences that the exhibition provided." 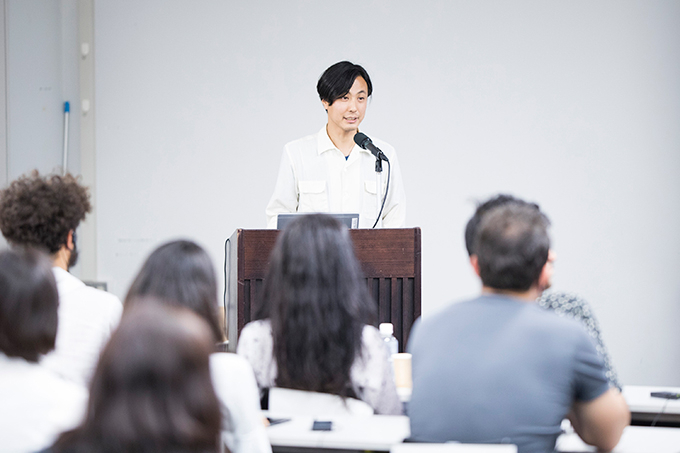 Exhibition curator Hiroyuki Hattori moderated the artist talk. 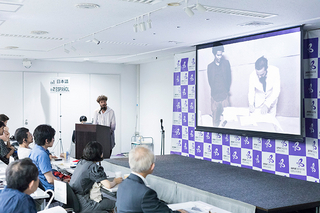 Hattori invited the Cuban artists to give presentations on the works they exhibited at the Tokyo exhibition, and to introduce their other creative activities. Glenda León was born in 1976 in Havana and is currently based in Havana and in Madrid, Spain. She began taking classes in visual arts at the age of 12 and trained in classical ballet while studying art history at the University of Havana. She is the recipient of numerous awards, including a Pollock-Krasner Foundation Award and has participated in a long list of major events including the 55th Venice Biennale in Italy in 2013, SITE Santa Fe Biennial in New Mexico, U.S.A., and the Dakar Biennale in Senegal 2018. At the time when Glenda began her artistic career, there were supply shortages in Cuba due to the United States embargo. She invented her own ways of expressing images and creating installations by making use of tiny everyday items such as soap, hair, chewing gum, used vinyl records, etc. 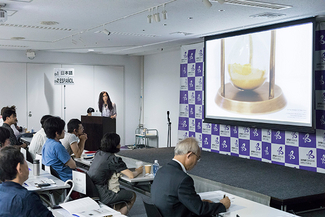 At the talk session, Glenda introduced several of her major works, including a painting depicting a horizon executed in powder of coins, which looks like a sand drawing; a book compiled by mixing scriptures from the world's five largest religions; music boxes engraved with the name of a divine entity; an installation that symbolizes the loss of time by means of a two-ton pile of sand and a hourglass; and a project installing maps of Havana and Miami on opposite sides of a swimming pool, making it possible to swim from Havana to Miami. Glenda said being brought up in a Greek-American family had given her opportunities to experience cultural diversity ever since her childhood. She also commented that the life of an artist is an honest way of living. She combines multiculturalist concepts with a realistic eye for the conflicting emotions and senses within individuals. 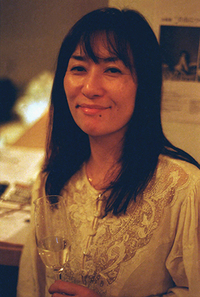 Her works, which are conceptual and at the same time filled with poetic expression, are animated by honest humanity and positive strength. Glenda León explains her installation work that employs an hourglass to symbolize the loss of time. Reynier Leyva Novo was born in 1983 in Havana, where he lives and works. After studying at the Higher Institute of Arts in Havana, he participated in the Liverpool Biennale and the Havana Biennale. In 2017, he was selected as one of the exhibiting artists for the Cuba Pavilion at the 57th Venice Biennale. Using video, photographs and installations, Novo confronts the world's structures of "history" and "power." He investigates events he considers important in the history of the world and of Cuba in order to create works that tie in almost-forgotten events, bringing them into close alignment with history. One of his representative works is Stone Words. Power architectures of an inherited country (2016), a masterpiece of walls built with nine types of marble from monumental buildings that date from pre-revolutionary Cuba. Among the other works that Novo introduced were Untitled (military and civilians), exhibited at the Tokyo exhibition, which is part of a series of rugs made from scraps of fabric and old clothes collected from various groups of people; an installation work representing the weight of avoidable death by melting bullets into weights; and a work with a ship navigating the Florida Strait, where as many as 72,000 asylum seekers are estimated to have died, with "Wait Forever" emblazoned on its sail. He also introduced a recent project in which, following the purchase of one of his new works by the Cuban Ministry of Culture, he donated the entire 3,800 U.S. dollars to support a dissident organization. His work is sophisticated and intellectual. In it, he visualizes some of the traces of power and violence recorded in the West's history (history with a capital H), silently posing the question, "Were we able to change the world?" When Reynier Leyva Novo sold a new work to a government ministry, he signed the money over to dissidents. Leandro Feal was born in 1986 in Havana and is currently based in Havana and Barcelona. 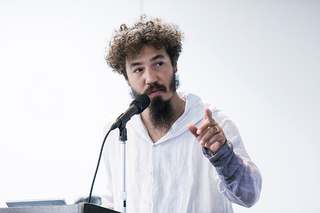 After studying at Havana's Higher Institute of Arts, he went on to study at the Behavior Art School in Havana directed by the Cuban artist Tania Bruguera (b. 1968). Recently, he has held solo exhibitions in Spain and Cuba. In his work as a freelance photographer, Leandro has experimented with exhibiting photographs in which Cuban cultural image and changes before and after the socialist Cuban Revolution overlap, and where the past, present and future intersect. In his 2017 solo exhibition entitled "Yo no hablo con fotógrafos (I don't talk with photographs)," he introduced photographic works portraying celebrities who visited Cuba from the United States as a result of the normalization policy of former US President Obama. His subjects included the Rolling Stones on a visit to Cuba to play a live concert there for the first time since the ban on rock music in the 1960s, and a Chanel runway show in Havana where he snapped designer Karl Lagerfeld getting out of a classic car, actress Tilda Swinton, and the National Library building that served as the backstage for the show. The scenes he captured are glamorous enough to be mistaken for photographs of Havana before the revolution. Leandro spoke from the perspective of somebody who had managed to get close to the action via one of the tightly secured neighboring buildings and taking photos from a balcony like a paparazzo: "This was a very commercial event, but I was at just the right distance for a Cuban." Speaking of a filming location for a Hollywood movie, he commented that: "American helicopters were flying above Havana without being shot down." In addition, Leandro introduced a number of works of photography portraying old generals and revolutionaries of the Cuban Government who gathered to join the funeral procession for Fidel Castro and who looked very much like 1950s mobsters. These were side by side with other works capturing contemporary young people in Havana who appear to be enjoying freedom. These works express the political and cultural distances between generations. Leandro Feal introduces his photographs portraying everyday life of young people in Havana. José Manuel Mesias was born in 1990 in Havana, where he currently resides. Since graduating from San Alejandro Fine Arts School in 2009, he has participated in many exhibitions in Europe and North America. In 2017 he held a large-scale solo exhibition entitled "Índice de imágenes (Index of Images)" at Factoria Havana art gallery. José, the youngest artist in the exhibition, reinterprets the past and present contexts in Cuba from the perspective of both concept and substance. He is a talented painter, although none of his painting was exhibited at the Tokyo exhibition. In his series of installations Las cosas que se parecen (Similar things), where large paintings are accompanied by small used goods and obsolete objects, an awareness of oppositional relationships such as between past and future or beauty and destruction is on view, while the artist simultaneously searches for ways to express the anxiety and amazement he experiences in his life. In the talk session, he showed video to introduce several of his large paintings and attempts to reinterpret history by adding depictions of fantastic episodes to and erasing iconic characters from historically famous paintings. 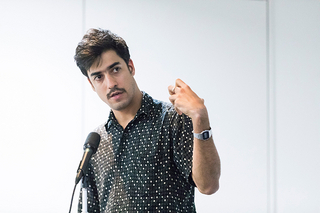 For José, an artist who sees history as "a process for reaching the next point," the process of archiving events that recount history and dealing with them as if they were mythical and stereotypical urban legends is a procedure that reflects the realities of contemporary Cuba. José Manuel Mesias showed an image of a seashell owned by José Martí, a historical Cuban hero. The shell gave him the idea to produce his solo exhibition, the "Index of Images." Following these individual presentations, the four artists answered questions from Hattori and members of the audience. The first was about art education in Cuba. According to the four artists and two curators from Cuba, the art and design programs provided at the Higher Institute of Arts have gradually shifted away from academic education, but there is a shortage of good educators, and it is not easy for individuals to determine career options by themselves. In practice, such decisions are often made from above in response to requests from educational institutions and workshops. Moreover, employment conditions such as salary are decided on the basis of the individual's profession. Families and relatives of art students often oppose their plans to become professional artists, and in many cases graduating students go on to become art teachers rather than pursuing a career in art. It remains difficult in Cuba for individual artists to achieve economic success on their own. The four artists talked about art education and freedom of expression in Cuba, and about their experiences and thoughts. Finally, the participants discussed freedom of expression. 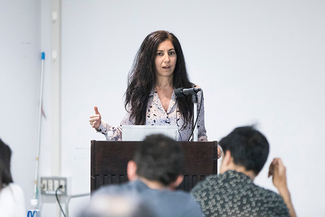 In response to a question on whether tolerance of free expression and severity of censorship differ between Cuba and other countries, Novo commented: "When presenting works related to politically or socially symbolic themes, I carefully consider compatibility with the context. If I have an opportunity to present my work overseas, I want the work to convey the reality of today's Cuba as much as possible." He also added that when exhibiting works at state-owned facilities, works related to anti-revolutionary images tend to attract criticism from officials and military personnel. However, at independent exhibitions in closed spaces that are not dependent on government funds there is almost no censorship. The impression I formed from listening to these Cuban artists is that when they create works touching on concepts that refer to the country's political or social system, they are mindful of the need to carefully remove any overt images or words that are likely to meet with government disapproval. Failing that, they limit the exhibition of such works to independent spaces owned and operated by members of their own groups. For public presentations of such works, they wait for opportunities created by overseas exhibitions or publications. 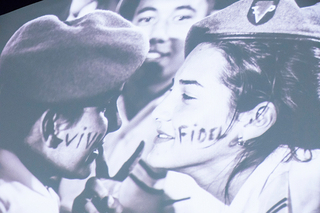 In Cuban society, where double standards and "diplomacy" are natural concerns, artists need to be adept at producing multiple layers of meaning and interpretation when expressing the historical views and addressing the issues that underlie their works and activities. I believe their strategic creative attitudes need to embody a sense of crisis incomparably keener than anything possessed by Japanese artists, notwithstanding the self-regulation and controversy that are encountered quite frequently in contemporary Japan. Glenda commented that viewing Cuba as unique in being extremely intolerant to art and subjecting art to strict censorship is an unfair stereotype. In some sense, the existence of fetters can be said to help artists in developing their art, and at the same time it can make it extremely difficult to deal with "freedom" in art. After listening to discussions on several critical issues related to aspects of the exhibited works, I was convinced by the value of this event in providing an opportunity to think deeply about the power and roles of curation as a conduit for connecting society and art.